Ehrman, however, is not afraid of breaking rank with his fellow scholars and speaking the truth. In his new book, Forged: Writing in the name of God—Why the Bible’s Authors Are Not Who We Think They Are (HarperOne; April 2011), the New York Times bestselling author debunks many popular myths about the Bible’s forged books and letters, including the idea that “writing in the name of another” was a common, accepted practice in antiquity. 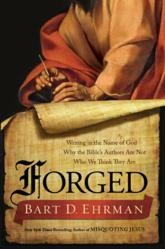 According to Ehrman, forgery was just as disgraceful then as it is today. Posing the provocative argument that parts of the Bible contain intentional deceptions, and that some of its texts were deliberately and painstakingly crafted to further the agendas of Christians living after the apostles, Forged will again turn upside down what we “know” about the Bible. Bart Ehrman is the author of more than twenty books, including the New York Times bestselling Misquoting Jesus, God’s Problem, and Jesus, Interrupted. Ehrman is the James A. Gray Distinguished Professor of Religious Studies at the University of North Carolina, Chapel Hill, and is a leading authority on the Bible and the life of Jesus. He has been featured in Time and has appeared on NBC Dateline, The Daily Show with Jon Stewart, The Colbert Report, CNN, History Channel, and other top media outlets. He lives in Durham, North Carolina.